Habit/Description: This very hardy perennial is a favorite for containers or deep shady corners in the landscape. Tall evergreen fronds, easy care. Broad dark green leaves. Special Interest: Many great attributes to this great perennial: Drought tolerant, evergreen, shade tolerant, and provides a large texture to the landscape. Great when used under trees, foundations and mixed borders. Care Information: Easy to grow , however needs regular watering. Requires full shade for best growing conditions. Protect from harsh winds. Clean out old leaves as necessary. Habit/Description: Muhly Grass is native to Florida's coastal uplands. This tropical native has found a home in many southern landscapes. 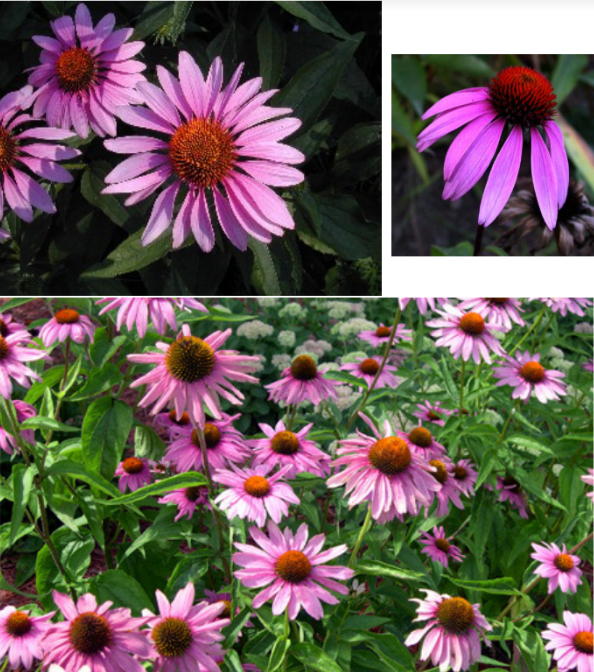 This perennial is easy to grow and has a dazzling pink fall display when its 3' plumes emerge. Flower: Pink plumes in fall. Special Interest: This beautiful grass is mounding green from spring to summer and displays beautiful, water-color-like pink blooms in fall. Leaves turn a lovely tan in winter. Gives the illusion of water in the landscape with the grassy, mounding texture. Good for containers, erosion control, mass plantings, poolside, rock gardens, urban and wildlife gardens. 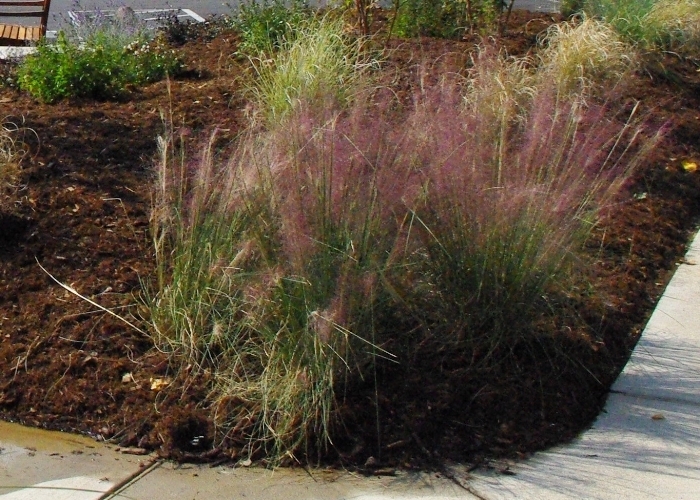 Care Information: Like most grasses, Pink Muhly needs full sun for best performance but can tolerate part sun. New plants will need to be watered regularly until established. After establishment, they are very drought tolerant. Plants can be cut back to the ground in late winter. Fertilize as they begin to emerge in the spring. A lovely white flowering variety is also available. Habit/Description: Beautiful mounding perennial. Dark green, grass-like appearance. Partial to full sun. Size at Maturity: 1' tall and 2 1/2' wide. Flower: lovely yellow, tubular lilies in summer to early fall. Special Interest: This gorgeous favorite is an easy care perennial. Beautiful yellow flowers in spring. Perfect for borders, coastal, containers, cutting garden, edging, erosion control, firescaping, mass plantings, poolside, rock, woodland and urban gardens, erosion control and very wet areas. Grass-like mounding perennial. Care Information: Does well in sunny conditions. Water thoroughly when first planted to create a deep rooting system. Tolerates some drought. Clean out old leaves and flowers when spent to help keep the plant healthy and encourage flowering. Needs well-drained soil. Adapts well to a variety of soils. The winter daphne has yellow-margined leaves and blush-pink flower buds that open to fragrant white flowers bloom in winter into early spring. The mounding 'Marginata' cultivar is beautiful in the winter landscape. Daphne odora is evergreen and shade loving. Native to China and Japan. Fragrant pinkish white flower in early spring. This beautiful little evergreen shrub is perfect for a mixed border, shady foundation, hedge, and variegated color in the landscape. The highly fragrant flowers are pleasing to have at entrances. They are also deer resistant, easy to care for and drought tolerant. Daphnes need to grow in fertile, humus-rich, slightly acidic soil. They prefer full sun or partial shade. Choose a spot with good drainage but not completely dry. Avoid transplanting and pruning. Does well under trees. Amazing little ground cover with bright chartreuse foliage. Has brightest yellow color in full sun to muted green in part shade. Very fast growing to 2-4" tall and spreading to 1-2' wide. Wonderful, easy-care, cascading ground cover with very bright yellow foliage. Perfect as a ground cover, in masses, borders and in containers as a filler. Roots extremely easily from cuttings. Can die during harsh winters. Easily grown in average to rich, evenly moist soil; tolerates damp or moist places but not standing water. Shelter from harsh afternoon sun exposures in hot summer areas. For a tidy appearance, remove old, faded foliage before new leaves emerge. Beautiful evergreen groundcover. Glossy green, fine textured leaves. Mounding/Spreading habit. Full sun. Fast grower to 1-2' tall reaching 6' wide. Tiny white blooms in late spring giving way to bright red berries in fall. Stunning ground cover that quickly becomes a tight mat that produces beautiful red berries in fall and winter. Perfect for borders, coastal and urban gardens, erosion control, firescaping, ground cover, rock and wildlife gardens. Grows easily in average to poor, well-drained soils. Space 4 to 5 ft. apart as groundcover; control weeds with mulch until plants fill in. Water deeply and regularly during the first growing season to establish an extensive root system; reduce frequency once established. Apply fertilizer in early spring. May be pruned annually to shape. Pruning time: spring after flowering. Orange or red in summer. Can have variegated leaf or red leaves depending on variety. Beautiful medium evergreen shrub or pruned to small patio tree. Gorgeous, white blooms appear in fall for a dazzling display. Dense, shiny dark green foliage and nice upright habit. Can be used as a screen shrub or pruned to maintain a tree form, Evergreen. Moderate growth rate and will reach a size of 8-10 feet tall and wide. Fall. White, semi double with ruffled edges and a bright yellow center. Blooms in fall; drought tolerant. Requires well drained soil. Follow regular watering schedule for first growing season to allow proper root establishment. Feed with a Camellia/Azalea acid based fertilizer in fall after flowering. Prune in winter/spring after flowering.